Engine side I just moved the mount back, drilled the arm for the bolts to mount it in its new position and then extended the bracket for the steady. Gearbox side i just moved the mount back and bolted it into a hole that was already on the arm. Other than that i did alter the bulkhead for the inlet manifold and took a piece out of the back of the subframe to clear the diff. Just make sure that you have the driveshafts in when you move the engine back to make sure they clear as mine are very close. Last edited by Readie; 05-09-2017 at 09:20 AM. 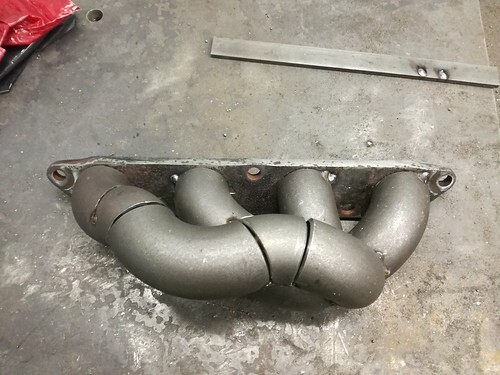 Where did you get your weld fittings from to make the manifold? Is it short or long radius elbows you used? If your making a manifold though its worth doing something abit more efficient than the log manifold like I am currently using. This is what i am working on at the moment. Last edited by Readie; 25-09-2017 at 09:38 AM. That looks pretty good, anymore pictures of it?